Stefan Frei has big ambitions, on the pitch and with his art. He has a project that intersects both worlds and is drawing criticism from some fans for its corporate backing. For Stefan Frei, goalkeeping is about denying creation. Frei says the duty of the goalkeeper is to stop the opposition. The task requires perfection, with no room for error, even less for creative expression. For Frei, that void is filled with his artwork, a lifelong passion. 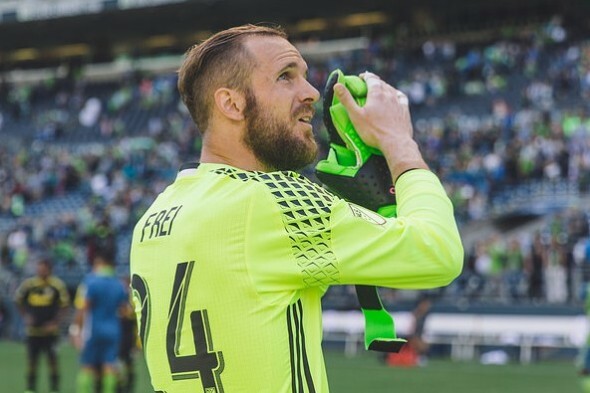 Frei is heading a project to create a giant tifo, to be displayed at CenturyLink Field before the Sounders’ game against the Chicago Fire Sept. 28. Frei’s interest in art was sparked by walks to school and to training as a boy, where he saw graffiti and wall murals. If you ask him to name his favorites, he provides a list of famous street artists, saying that the graffiti form (which has gained some grudging acceptance in traditional art circles in recent years) most appealed to him. Once, when visiting family in his native Switzerland, Frei made a point of touring murals created by Smash137, a famous local artist and one of Frei’s inspirations. Frei, a Swiss national with a green card, wanted to major in art or architecture while attending Cal, but the demands of the NCAA Division I training and travel schedule made either major not feasible. Frei said Tuesday that art helped alleviate the stress of soccer. When Frei turned pro, his mother bought him a digital tablet as a gift, furthering his work with digital art. The other benefit of digital work, in addition to matching his graffiti-inspired style, was the undo button. According to Frei, a goalie’s perfectionism doesn’t end when he steps off the pitch. Of course, putting paint on canvas, especially one planned to be 200 feet long and 75 feet high, won’t have an undo button like Frei’s tablet. While Frei said he normally has the advantage of stashing away pieces he is displeased with in his files, there’s no hiding this project from the 36,000-plus who may be on hand for the match. “It’s a daunting process,” Frei said. “It’s scary because I could spend 60 hours on a project, and I don’t like it, it gets filed away. Frei isn’t alone. Fans, local art students, and other groups will have opportunities, under Frei’s guidance, to work to complete portions of the canvas according to his vision. Frei said that he hopes the project gets others interested in art, or inspires them to pursue their passions. Big as the opportunity may be for Frei, some fans have taken aim at the project due its corporate nature. The art is sponsored by Delta Airlines, an official sponsor of the Sounders that has recently beefed up its presence in the city through television and radio ads. 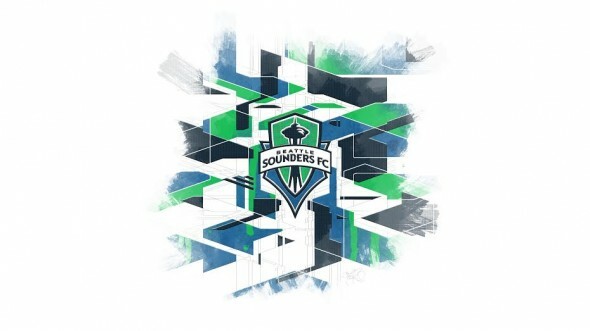 The official press release boasts that the final piece of the project will be painted at 30,000 feet on a charter fan flight to Portland for a match against the Timbers. The Emerald City Supporters group claims that the tifo (the term for the large banners displayed at soccer matches, a shortening of the Italian tifoso, meaning fan) is a marketing gimmick. The group posted a statement titled, “The Fabric of Betrayal,” on its website Wednesday, drawing a line on the canvas. “Corporate ‘tifo’ isn’t what tifo is about,” the statement said. “Tifo should never involve money from a club’s FO nor its corporate sponsors, regardless of it carrying any corporate branding or not. The debate over whether big-money sponsorship should be involved in art has been around a long time. Frei admitted that while the design for the project was his, the concept to do it was not. If controversy regarding their work makes an artist great, Frei seems to be off to a prolific career. Even if Frei’s intentions regarding the project are pure, the corporate sponsorship will raise eyebrows from the sector that disapproves of the mingling of sport and business, particularly as it encroaches on forms of expression that fans consider to belong to them. Frei said that he didn’t intent for his project to offend anyone. Sponsored or not, the project is another chance for Frei to take his off-field passion to a new level. If Frei’s art serves as his emotional release, then a successful unveiling may raise his game. The MLS Players Union released its salary figures Thursday. Clint Dempsey topped the list for the Sounders, set to make $4.6 million this season. Nelson Valdez was the only other player making seven figures, earning $1.5 million. Osvaldo Alonso was third at $950,000, though Alonso does not count as a designated player because the Sounders bought down his cap hit using allocation money. The other interesting figure was the salary of Jordan Morris. Acknowledged to be the highest-paid player on a homegrown contact in MLS history, Morris will earn $190,500 as a rookie. Don’t care about the controversy. That’s some amazing design work. “my room mate Mary Is getting paid on the internet $98/hr”…..!kj145ytwo days ago grey MacLaren. P1 I bought after earning 18,512 Dollars..it was my previous month’s payout..just a little over.17k Dollars Last month..3-5 hours job a day…with weekly payouts..it’s realy the simplest. job I have ever Do.. I Joined This 7 months. ago. and now making over hourly. 87 Dollars…Learn. More right Here !kj145y:➽:➽:.➽.➽.➽.➽ http://GlobalSuperJobsReportsEmploymentsAuthorityGetPay-Hour$98…. .★★★★★★★★★★★★★★★★★★★★★★★★★★★★★★★★★★★★★★★★★★★★★★★★★★★★::::::!kj145y….,……..